After the Annexation of the Punjab by the East India Company, a proposal was laid down in 1864 by a Captain Tighe (then Deputy Commissioner, Umballa, Punjab) to build an institution for the Punjabi Sardars. This suggestion was later reformed into a School for Wards of Court continuing the foundational basis of teaching the young Sardars. The proposal fell into the hands of the Lieutenant-Governor Sir Charles Aitchison in May 1885, who further developed the ideology by laying the foundations of the school. It has been reported that the school was to serve education to young men from the ruling families, good families, and the minors under the guardianship of Wards of Court. It was named the Punjab Chief’s College which was later renamed as the Aitchison College in 1886. The history of the College can be traced 'unofficially' to 1868, although the foundation stone of this building was laid on the 3rd November, 1886, by Viceroy Lord Dufferin and Ava. Aitchison College has a rich past that is vital to preserve, conserve and exhibit, including invaluable historical narratives as well as documents in all forms. To honor and preserve the heritage of this astounding institute, the Archives Department has been setup to restore archive material since the College’s inception. One of our chief aims is to collect and save personal experiences of the Alumni, Faculty and Staff in regards to their time spent in/with the College. These experiences will be documented in the shape of Oral Histories. We also wish to collect photographs, manuscripts, letters, medals or any other archival material which is related to your past in Aitchison. The Archives Centre seeks to become a bridge that connects the past with the present. It is our aim therefore that Aitchison’s Archive Centre will serve as a beacon of guidance and knowledge for the years to come. Our Archives department keeps all available records and displays many of these in the New Archives Centre. The Collection is revised as more material is processed, donated or collected. Great efforts are being made to preserve and conserve our archival material as we are aware of their invaluable significance. We have also started to digitize our archives and aim to continue this process as it is vital for preservation. A vast amount of material exists in our storage such as photographs, records, manuscripts, medals, cups, trophies, letters (typed and hand written), along with various other objects and documents. If you wish to donate/loan out or give copies of your collections to the Archives Department or make an appointment for our Oral History Interview segment, kindly email at archivist@aitchison.edu.pk. On Monday 13th November, 2017, the newly established Archives’ Display Centre was officially inaugurated at the Aitchison College Mandir. The building has been sensitively utilized for showcasing Archival material. The inaugural exhibition showcased some of the earliest pieces of the College’s history from 1886 to 1953. The selected pieces provided a glimpse into life at Aitchison College before and after the 1947 Partition. 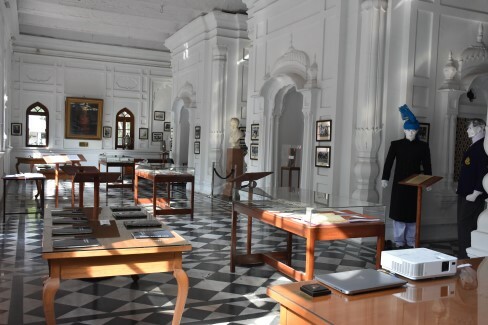 The Archives Centre has been established to preserve, conserve and exhibit invaluable historical narratives and artefacts that reflect the rich past of Aitchison College. 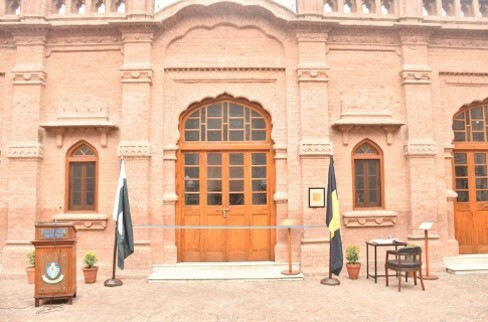 Aitchison’s Archive Centre is now a permanent feature of the College. How can I donate my collection? How can I share my personal time and experience at Aitchison and be a part of the Oral History segment? Who will use my collection? Your collection or Oral History Interviews will be safe in our archives. These could be exhibited on our social media page or website. The archives center aims to set up exhibitions from time to time and your collections can be chosen for exhibition displays as well. Your name as the donor of the material will always be mentioned in our records. This material will not be used for profit or marketing purposes but will only be used for the purpose of College’s archive display and research. The records of the archival material given to us in any form will be securely kept in our repository. However, if you don’t want your collection or narration to be displayed or shared with the public, you may inform us accordingly. Can I donate copies and keep my originals? We prefer to collect original records and materials rather than copies. It is preferred to use originals both for the purpose of readability of the document and for the proof of authenticity. We will provide to donors, free of charge, photocopies of any collection donated. In exceptional cases, the Archives will accept high-quality copies of very significant materials should a donor be unable to donate the originals. For visit appointments, please send an email to the Archives Department.